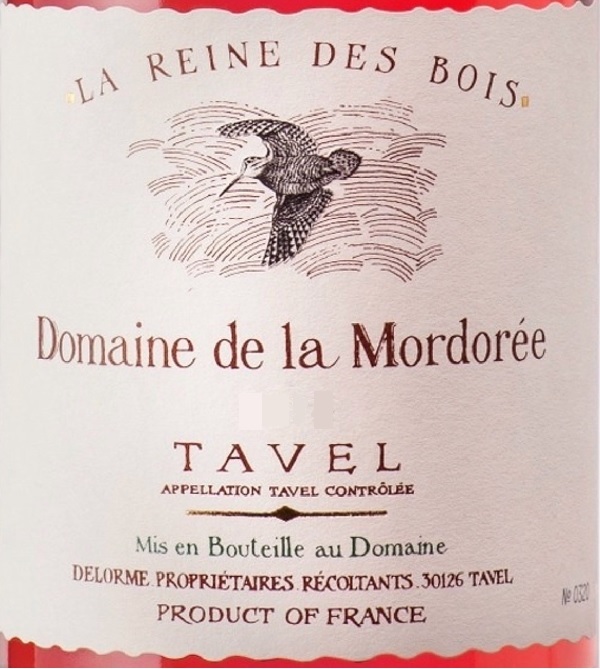 Mordoree Tavel Rose Reine des Bois is made from 60% Grenache, 15% Clairette, 10% Syrah, 10% Cinsault, 5% Bourboulenc. Nose: Steady rose, brilliant and cristal clear. Palate : fresh, classy, elegant, very long. Aging capacity : 8 to 10 years. This wine comes from a parcel planted on a pebbled soil covered with stones, whose geology is typical of the grands crus from the Rhone Valley (a base made of marine molasse from the Miocene period covered with an alpine diluvium from the Villafranchian period). 100 % destemming, cold maceration during 48 h., pneumatic pressing, fermentation at 18° C.
To pair with: roasted and or spicy chicken, duck, goose, fish soup, white meat, seafood and a lot of fishes (tuna, John Dorry, red mulet, etc...).Quite all Asian cuisine. Dishes with garlic, dishes with tomatoes. "Limpid orange. Vibrant and expressive on the nose, displaying cherry, blood orange and floral scents and a building mineral note. Sappy red currant and bitter cherry flavors flesh out slowly with air, picking up a hint of fennel on the back half. The finish hangs on with impressive tenacity, leaving behind bitter orange pith and cherry pit notes.- Josh Raynolds"
Best to drink 2 years. Pairs well with white meats, Asian cuisine and excellent as an aperitif.